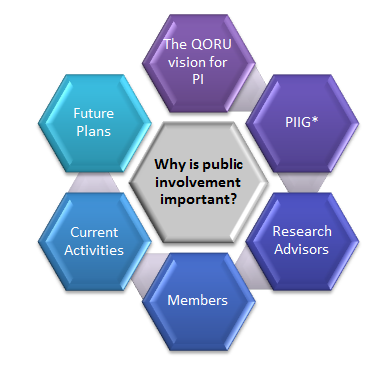 Why is public involvement (PI) important? There is now wide acceptance that the quality and value of research is enhanced by the involvement of the public throughout the research process, and is more likely to ensure that the most relevant questions are addressed, that acceptable research methods are used, and that the most important outcome measures are chosen. For these reasons, bringing a public perspective into discussions about how and where we involve the public within the work of QORU is a key element in ensuring its success.